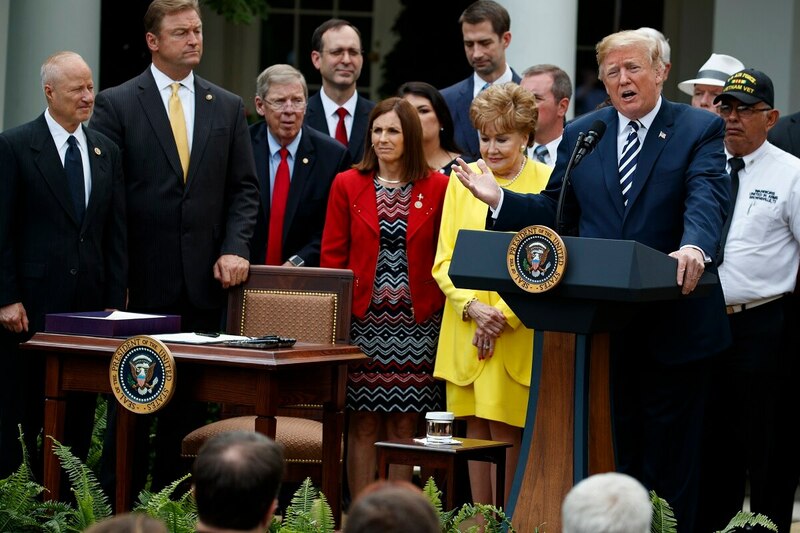 WASHINGTON — President Donald Trump signed the sweeping $52 billion VA Mission Act into law on Wednesday. Now the fight starts over what that means. The measure, which drew bipartisan support in Congress and effusive praise from Trump at a White House signing ceremony, lays the groundwork for an overhaul of the Veterans Affairs community care programs, with the promise of easier access to free appointments with private-care doctors for veterans. But major questions remain over how the new provisions will be funded and exactly who will benefit from the overhaul of Veterans Affairs health care offerings. Specifics of who will be eligible for the new community care offerings won’t be settled for another year. Veterans groups are gearing up for months of negotiations behind the scenes on rules regarding when patients can seek outside care and what role department medical officials will have in continued oversight of their medical treatments. “We have faith this administration will properly execute on the regulatory process,” said Dan Caldwell, executive director at Concerned Veterans for America. The bill also includes an expansion of caregiver benefits to veterans of all eras and plans for a review of all VA facilities in coming years, with an eye towards dramatic changes in the department’s national footprint. But the health care aspects were the most controversial and most challenging for lawmakers. Although the legislation received bipartisan support in Congress and among veterans groups, critics of Trump have warned that the reforms could open the door to widespread outsourcing of veterans medical care to private-sector doctors. That makes the upcoming rule making for the VA Mission Act a potential battlefield for both advocates and lawmakers. Numerous Democrats have accused Trump of working to privatize VA responsibilities, and major veterans groups have expressed concerns with funding being sent from within the department to outside doctors. Officials from Vietnam Veterans of America noted that deadlines mandating certain decisions on the new regulations be completed within 120 days have the potential to produce rushed, problematic new guidelines. Also complicating the issue further is a memo to Hill staffers from White House officials opposing a Senate plan to raise non-defense spending caps to cover the costs of the new VA reforms. Administration officials say that money should come from cuts elsewhere in the federal bureaucracy. The looming fights come after more than a year of intense debate on the issue of VA health care. More than one-third of all VA-funded medical appointments are handled outside the VA medical system, but Trump has repeatedly lamented that too many veterans are trapped using the federal system as their only health care option. Trump praised Republican congressional leaders for passage of the measure, but did not invite Senate Veterans’ Affairs Committee ranking member Jon Tester, D-Mont. and a co-author of the measure, to the event. Rule-making responsibilities for now fall to acting VA Secretary Peter O’Rourke to oversee, although he is expected to return to his role as chief of staff after the confirmation of Robert Wilkie as the new permanent VA secretary. No timeline has been set for that process.